A while back, I talked about my George Bailey circumstances. Of course, some people will get confused and say that I am some sort of altruistic credit union sort, which I can be on the odd Thursday. 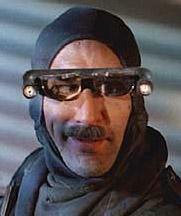 I am more like Archibald (Harry) Tuttle, the rogue heating engineer in the Terry Gilliam movie "Brazil". Harry Tuttle: Listen, this old system of yours could be on fire and I couldn't even turn on the kitchen tap without filling out a 27b/6... Bloody paperwork. Sam Lowry: I suppose one has to expect a certain amount. Harry Tuttle: Why? I came into this game for the action, the excitement. Go anywhere, travel light, get in, get out, wherever there's trouble, a man alone. Now they got the whole country sectioned off, you can't make a move without a form. Like me, he tends to be competent, efficient, quietly conspiratorial, and appropriately paranoid. Harry understands how his world really works and has found his own ways to cope that, although against all social norms, work well enough. Above all else, Harry Tuttle seems to eek out happiness and authentic purpose in a stupid and superficial world! What a great guy! Getting the Best of "31 Flavors"